An innovative approach to cutting out the supply of drugs in Wrexham and supporting the victims and local communities “who are fed up with the criminality on their doorstep”, has been launched. Last week Wrexham.com reported that five men had been arrested in the Caia Park area as part of Operation Loot – an ongoing effort aimed at tackling the circulation and supply of drugs in the Wrexham area. But along with what has been described as a “concerted attempt to take drug dealers out of circulation”, Operation Loot aims to provide a “wraparound” service to substance users and local communities. Speaking to Chief Inspector Mark Williams on Friday, Wrexham.com asked why he felt the somewhat unusual response after the drugs related raids had been taken and why he believed it was needed. “We’re trying to look wider at the knock on effects of the positive action we are taking,” explained Chief Insp Williams. Friday saw the start of a week-long programme of events aimed at offering reassurance to the Caia Park community and additional support to service users. This include enhanced support at the care hub in Rhosddu (more here) along with additional partners and agencies provided signposting to additional services going forward. Elsewhere in Caia Park there was a police mobile unit on Whitegate Industrial Estate offering crime prevention advice; along with officers, volunteers from AVOW and the fire service visiting residents and offering reassurance on the action taken and plans for the future. Chief Insp Williams said: “The operation and the arrests has been ongoing for three months. In more recent weeks we decided to adopt this wraparound service to try support the community in Caia Park and across Wrexham. “The action came about from information from members of the public, so we want them to know what we have done. Going into this week there will also be an increase in support in the Caia Park area, with North Wales Police teaming up with Wrexham Council, North Wales Fire and Rescue Service and third sector agencies to carry out a series of community activities. These include a clean-up, grass cutting, graffiti removal, litter picks and skips for residents to dispose of any rubbish they may have. “It’s all about making it look and feel nicer down here as a result of some of the positive work that has gone on,” explained Chief Insp Williams. He added: “This is a trial and it’s an approach that we haven’t done before. If it successful and the feedback continues positively, it is something we will look to do with other major arrests. The police efforts has been welcomed by Queensway Councillor Carrie Harper, who said: “The police work in the area recently has been outstanding and I’d like to thank local officers and PCSO’s for their efforts, which will undoubtedly help to improve quality of life for local people. 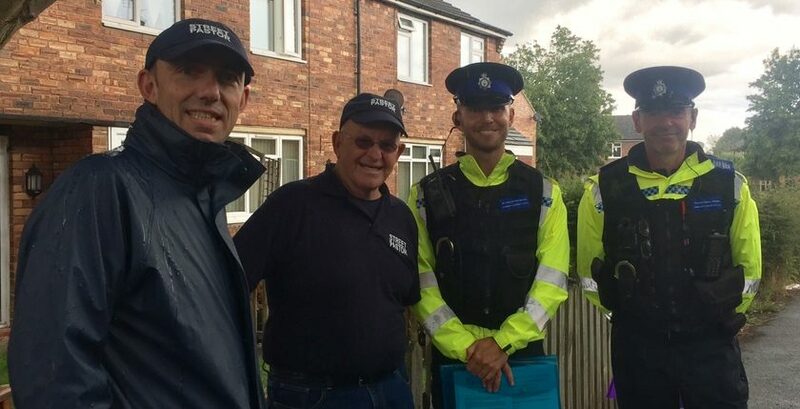 “I’ve been out knocking doors with our local PCSO’s and street pastors today and I know the increased visual presence in the area is helping to reassure residents. “There is of course often a lot of work going on behind the scenes that residents aren’t aware of and it’s good to reassure people there’s plenty happening. Cllr Harper added: “I’d also like to take the opportunity to encourage local residents to pass any information they feel is relevant to the police to help them with their work. “There are lot’s of ways to get in touch, you can call in to the mobile police station this weekend, or get in touch via the 101 line, the north Wales police web chat, or by contacting Crimestoppers which you can do anonymously on 0800 555 111. North Wales Police and Crime Commissioner Arfon Jones also praised the work, stating: “The supply of drugs is a priority in my Police and Crime Plan and I welcome this successful operation by North Wales Police.